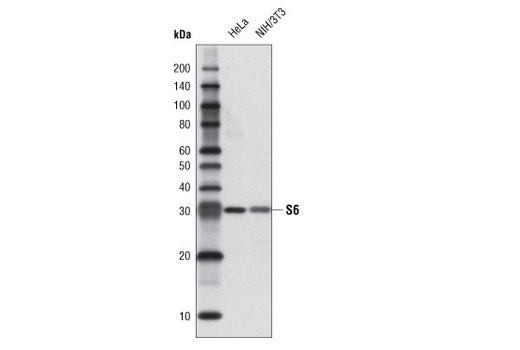 Western Blot analysis of extracts from HeLa and NIH/3T3 cells using S6 Ribosomal Protein (54D2) Mouse mAb (Biotinylated) #3944 followed by Anti-biotin (D5A7) Rabbit mAb and anti-rabbit IgG, HRP linked Antibody #7074. ELISA using Anti-biotin (D5A7) Rabbit mAb coated plates to capture biotinylated phospho and non-phosphopeptides. 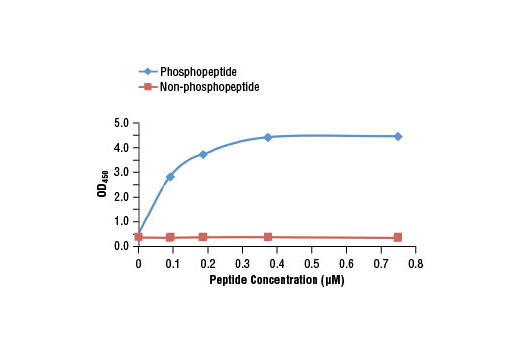 Peptide detection was performed using Phospho-Tyrosine Mouse mAb (P-Tyr-100) #9411 followed by Anti-mouse IgG, HRP-linked Antibody #7076. TMB Substrate #7004 was added for color development. ELISA showing absorbance at 450 nm of biotinylated and non-biotinylated peptides detected with Anti-biotin (D5A7) Rabbit mAb at different concentrations. TMB substrate #7004 was used for color development. Supplied in 10 mM HEPES (pH 7.5), 150 mM NaCl, 100 µg/ml BSA, 50% Glycerol and less than 0.02% sodium azide.Store at -20C. Do not aliquot antibody. Anti-Biotin (D5A7) Rabbit mAb recognizes biotin attached to proteins, peptides, oligonucleotides, or solid matrices. Monoclonal antibody is produced by immunizing animals with a biotinylated protein. Biotin is a water-soluble B complex vitamin (vitamin H or B7) that serves as a coenzyme in various metabolic functions. It transfers carbon dioxide for five carboxylase enzymes and is involved in the TCA cycle and gluconeogenesis. In addition, all cells require biotin for cell proliferation, production of fatty acids, and metabolism of fats and amino acids (1). Biotin recycling and attachment to histone proteins is catalyzed by an enzyme named biotinidase. Histone biotinylation is involved in regulating telomere attrition and cellular senescence. Biotinidase deficiency is a rare genetic disorder that can cause neurological and cutaneous symptoms if left untreated (2). Biotin has a high affinity for its natural ligand, avidin. The complex and irregular structure of the biotin-binding site makes it highly optimized for biotin binding and confers great specificity to the avidin-biotin complexes (3). This remarkable affinity has been exploited for numerous immunoassays including ELISA, Flow Cytometry, Immunofluorescence, In Situ Hybridization, Affinity Chromatography, and Immunohistochemistry. 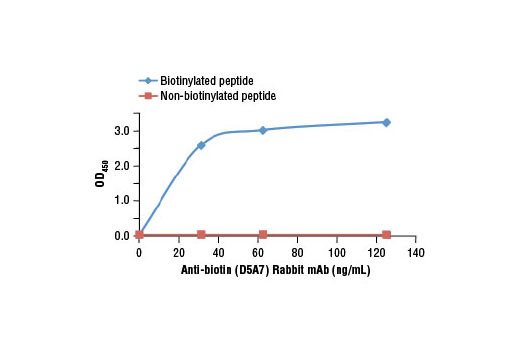 Anti-Biotin (D5A7) Rabbit mAb can be used as an alternative to avidins in order to minimize background and maximize signal intensity. Zempleni, J. et al. (2010) Biofactors 35, 36-46. Pindolia, K. et al. (2011) Mol Genet Metab 102, 161-9. Reznik, G.O. et al. (1998) Proc Natl Acad Sci USA 95, 13525-30.